On the corner of Salhouse Road and Mousehold Lane is a model aircraft which you can see below. 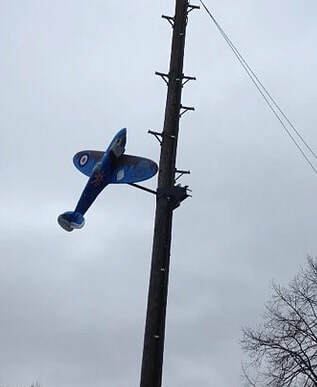 It was put there to commemorate the 100 years of the RAF. The bungalow in the picture below used to be a Cafe called Anne's Café and was run by a woman and her daughter Anne. I've also been told there used to a parrot here that swore lots! There was also a poodle dog roaming the café! This has now closed and has been transformed back into the bungalow you can see below. Anyone know when it closed as a café? In the First World War, ammunition made at factories on Salhouse Road (Boulton & Paul) was transported on a light railway on a track through the heath and linking with the tramway before making its way to the Railway Station. Remnants of the rails could be seen until quite recent times in the Station area close to Thorpe Road. 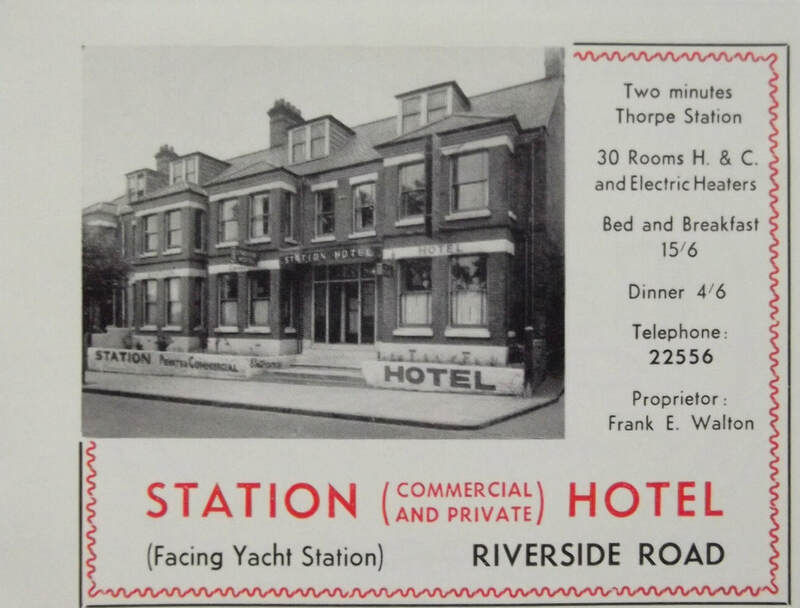 This building on Salhouse Road was originally called The Yeoman which was built in March 1957 around the same time as the Heartsease Estate estate was being built. The landlord was a Londener called Mr Harry Burnham and his wife Doris. Harry was the landlord of The Yeoman Public House for the majority of the pub's life until he retired. 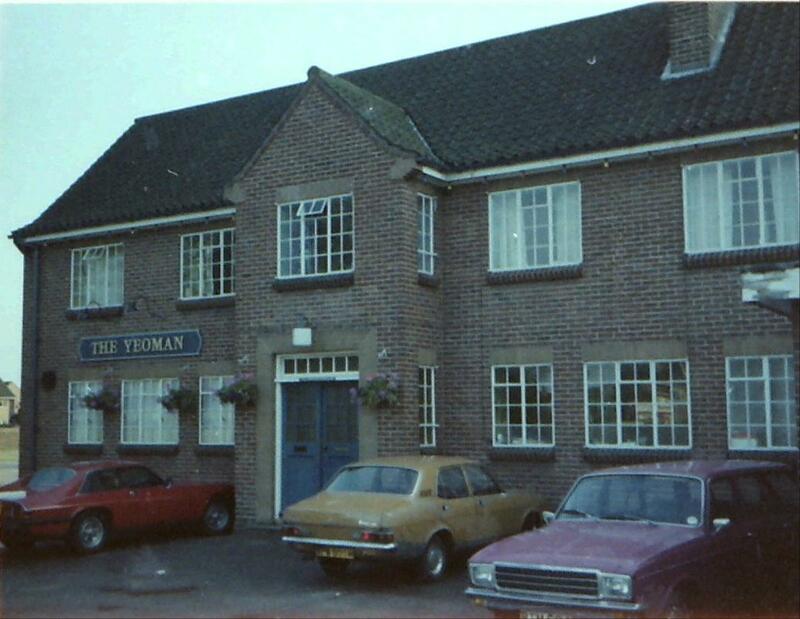 The pub was possibly named in honour of the Norfolk Yeomanry, formed in 1785. 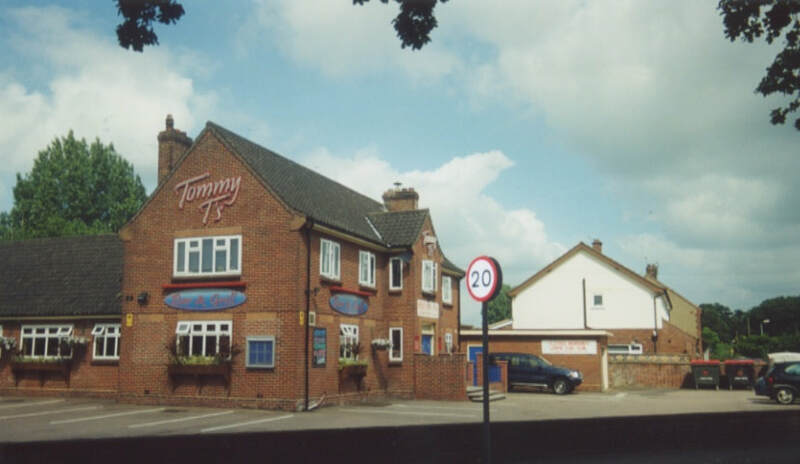 In March 2001 the pub was later refurbished and then run by David Turnbull who also runs the Blue Boar public house on Sprowston road and renamed Tommy T's which was named after David's son This was an American style burger and steak house. The restuarant was famous for its "Elvis Burger" which was massive. I know as I ate a couple of them and felt very full afterwards! A couple of years later Tommy T's was again taken over and now it is currently called "Fatso's" and is run by Anglia Restuarants and sells alot of the same things that Tommy T' did. If you look at the entrance on Falcoln Road you can actually still see an old Tommy T's sign! While walking down the road I noticed the houses start at no 12! Anyone know what happened to the rest?! Maybe Nos 2-10 were also there once but knocked down to make way for Heartsease High when it was built? There used to be a big Boulton & Paul building near the corner of Salhouse Road and Moushold Lane. They made aircraft. I need more info please help! There was also aerodrome cottages where Dunelm Mill now stands. I had lived on the housing estate diagonally opposite to this place for 32 years! It got redeveloped in either the late 1980s or early 1990s so that it was just fuel and a shop. A car was was added to the rear of the new building. 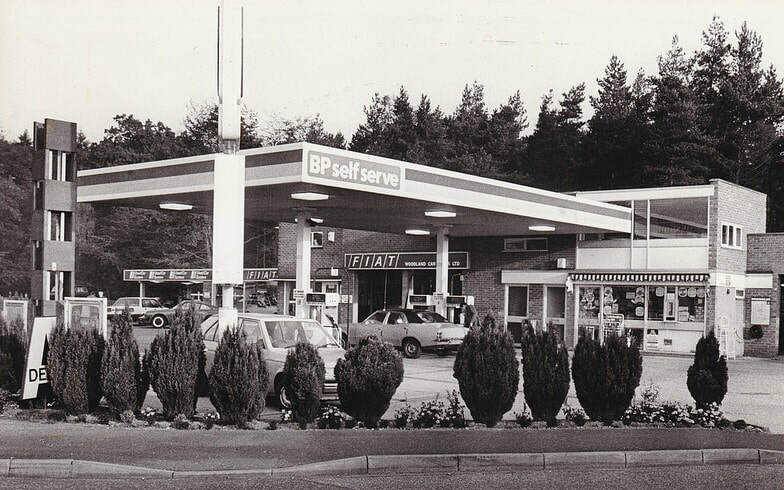 On the old pictures at the top it shows Woodland Car Sales and the BP petrol station. It got redeveloped in either the late 1980s or early 1990s so that it was just fuel and a shop. A carwash was was added to the rear of the new building. Ray Gimbert on Facebook tells "I used to work on the pumps at Woodland Car Sales and that his Dad ran it. "As far as I can recall it's always been a BP filling station. Dad is long gone now, but when he bought into the company, he had a showroom added to the workshops, which after several successful years of trading was then pulled down and rebuilt into it's current configuration. After dad retired, it was then split into two business's, where dad's partner retained the petrol sales, but sold on the workshops and new showrooms. Since then it has been several different companies ranging from boats showrooms to now CJ Ball". CJ BALL NORWICHBased in the heart of Norfolk our aim is to provide a comprehensive range of products and services for our customers. As a franchised Honda and Suzuki dealer we can offer a fantastic selection of new motorcycles and scooters along with an extensive range of quality used bikes of all brands. Our in-house motorcycle training school can get you started and our service & accessory departments will keep you going for years to come. CJ Ball was established back in the 50's in Hales and later moved to Norwich. On the 1969 - 1971 map here it shows the petrol station. In the 60's was managed by a man named Alfie Shailer. The station closed on Saturday 30th April 2011 due to rising fuel costs. On 22th June 2011 the pumps had been removed and the shop has been emptied. The cash machine is still working as is the car wash. I really wanted to get some pictures inside it before it closed but sorry I did not get time. I believe the shop and forecourt will now be used by the bike shop next door. This is a great shame and I would supsect lost lots of customers because of the Tesco petrol station. 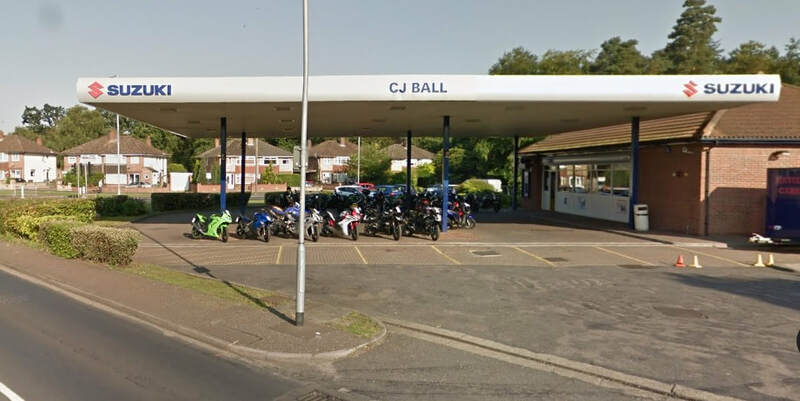 Update: 3rd November 2011: CJ Ball have been working on converting the petrol station into a new bike shop and its almost complete. Signs are up on the cover. Bikes are in the shop. On a map from 1908 0n this website it shows Greenborough Farm and in brackets it said it was a smallpox Hosptial close to where the entrance is to Deloney Road but I have also read it was opposite where Fatsos is now and thats why there wasnt any houses built on that bit for ages even though there are some new houses there now. If anyone knows more please let me know. Has this hosptial got some link to the naming of Greenborough Road? This family buisiness has been trading since 1936 from the same site you see today at Grange Farm close to The Racecouse. I have emailed John so hopefully he will send me some pictures or more info on his business. The airport was opened by HRH The Prince Of Wales in 1933. Boulton & Paul built the airport for flight testing and making airplans. Believe it or not where The Heartease estate is just off Salhouse it used to be the original Norwich airport! If you go down Roundtree Way you can see some of the original old aircraft hangers and there is another big one on Salhouse Road close to JJB Sport. The airport closed and moved where the current Norwich Airport is when RAF Horsham closed. Established in 1989 on another site on 32-36 Harvey Lane and the company moved to new premised in 2012 on the old site that used to be the Esso petrol station and later Goldstar Taxis. In 2009 Nigel Farrow Cars demolished the old site with the old house that housed Goldstar taxis. Established in 1989 Nigel Farrow Cars Ltd. moved into it’s new, purpose built premises at 101 Salhouse Road in 2012. Our MOT Testing Station and service repair workshop comprises of three MOT bays for testing cars, light vans, heavy vans, motorhomes and a five bay workshop where we can service and repair all makes and models of vehicles. Since it was finished in 2012 to our specifications, we are welcoming customers who have been with us for many years (some from the very beginning) and look forward to meeting new customers on a daily basis. Open Academy is a secondary school with academy status located in the Heartsease area of Norwich, in the English county of Norfolk. The academy was first formed in September 2008, replacing Heartsease High School. Originally housed in the buildings of the former school, Open Academy moved to new buildings in September 2010. It is a Christian school that is sponsored by the Bishop of Norwichand businessman Graham Dacre. The school offers GCSEs, BTECs and vocational courses as programmes of study for its pupils. The school has a specialism in environmental science and offers courses geared towards the specialism. Open Academy was formerly a part of the Kett Sixth Form College consortium, which also includes Sprowston Community High Schooland Sewell Park College. The Kett operates as a separate entity to its host schools. As of 2013, the Academy gained a separate Sixth Form, to be known as OA6 which is led by Claire Nugent. OA6 is a small, but growing Sixth Form, offering a variety of A-Levels and BTECs. If you look at this shop there are 2 doors. This was once actually 2 shops Bartams and Jubbs. Bartums Newsagents was on the left hand side. It was run by Frank and Elsie Bartram. It later became a Mace shop. Jubbs was on the right hand side of Woodside News as you look at it today. 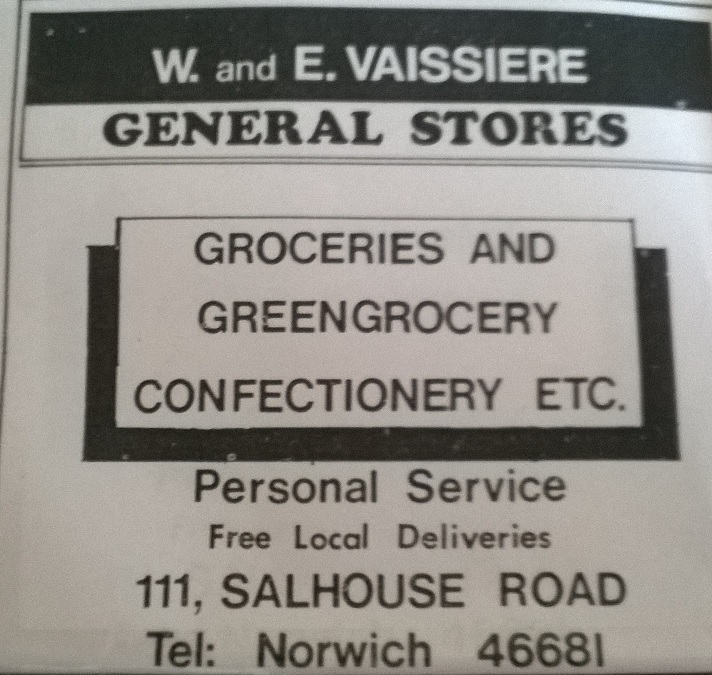 Alan and Jean Jubb owned the shop for over 30 years and it was a Mace grocery shop. They sold the shop in 1976. Jubbs was sold to Doug and Sarah and then knocked into one as it is today. Thanks to John Jubb (Alan and Jean's son) who emailed me. There was briefly a kebab van on the car park around 2015 but it was soon gone. The building where Wilco is now used be called Breck Farm and later it was an egg packing factory called New Lay Eggs by Nurdin and Peacock. The Wilco stores is owned by The Shortis Group and in October 2013 celebrated 50 years in the trade. The company started in a small shop on Barn Road. Taken from their website here is a little history lesson about the company. "The Wilco success story started in 1963 when Kevin Shortis as a 23 year old opened his first Motorist Discount Store in Norwich, bringing cut price, branded products to local car owners. It was an immediate hit. More stores were opened until in 1971 the company was taken over. However, this was not successful, due to the lack of personal attention and after a few years Kevin Shortis formed Wilco Motor Spares and then bought back four of his original stores including the Salhouse Road Head Office. Now joined by his son Richard, Wilco had expanded to 18 outlets by 2004. In August of that year, Wilco took over the Leeds-based Motosave with it's 24 shops and fitting bays, therefore increasing the group to 42 stores staffed by over 600 enthusiastic employees, who are there to help by offering the right stock at the right price." If you drive out of Norwich towards Rackheath on Salhouse Road go past The Racecourse and on at the very 1st tight bend in the countryside just to the left of this used to be a layby and in this layby was the entrance to the old rubbish tip. This area is called Bulmer Coppice. Before this building was built it was the site of the old Grandstand as next door used to be The Norwich Racecourse. The new building you see today used to be called Sprowston Grange and was a 14 bedroom hotel and country club on a seven acre site. On 9th July 1940 Two Luftwaffe bombers started an air raid and that air raid dropped a bomb next to Sprowston Grange where it killed the wife of a carpenter. Thanks to Jean Green who has sent me this. "In the late 1940's and 50's it was owned by the Hammond family and the Old Rackheath Cricket Club played on a field behind the house." The building is more known for the Washington 400 Club that was next door. It is now the childrens play area. This club opened in December 1965 and was a nightclub that opened after 11pm that included live music, a casino and strippers such as Tropical Linda. Roy also brought big stars of the day to the venue including Bob Monkhouse. Frankie Howerd, and Engelbert Humperdinck. Tony Weston was the Compere. Margetson Avenue studio in Thorpe Hamlet in the afternoons and in the evening play at the club around this time. He also used to have local bands at the time record demos at his studio. Some of them recordings are here on Pete's website. Pete now lives in San Francisco. I thank Pete for his info and the awesome picture below! In June 1970, the Washington 400 Club closed because it had lost its licence after a change in the gaming laws. The Washington Hotel and The Washington 400 Club sold for £40,000 in 1970 to Martham Farmer, William Chapman. He also kept the golf course next door. Chis. Baumann who came over to the UK from Zurich. In the 1980s The Washington Hotel was renamed Ebeneezers. An aerial map from 1988 shows it has a swimming pool to the right hand side of the Hotel. I have also read on the internet at some point it was called The Hotel Eiger and the Manager was a Mr Chis. Baumann who came over to the UK from Zurich. It was also once a Brewers Fayre pub. But if you can help I need dates please thanks. In 1995 it became The Racecourse which got its name from the old race track behind John Fairchlough Cars. In 2001 The Richardson Group brought the pub. refurbished the whole pub and play area. On 23rd August 2013 it reopened. "Squash club built when it was the Eiger,then it became Georgian Hotel and Squash club, then when the Georgian was sold the squash club and hotel went their separate ways - sorry Ross Patzelt no pics though - nb. the squash cub was opened on an August 1st to coincide with Swiss National Day, opened by Alan Ball, don't know why 'cos he didn't play squash!" "I worked at the Washington club 400 when it first opened first act to perform their were the dallas boys then Lonnie donegon it was a hectic place to work I was the bar cellar man can tell you lots of stories. 1953 after moving from its other factory in London. Before 1935 the factory was a Caleys chocolate factory. They had a big fire in 1963 and if you look closely at the building near the roof you can see bits of black. Is this signs of the old fire? It closed in 1998. 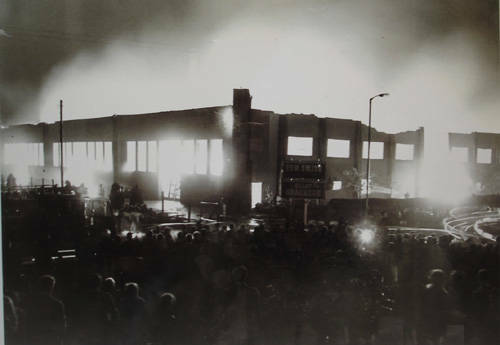 Picture of the Tom Smith Norwich factory fire in 1963.